Marshfield -The City of Marshfield and Marshfield Utilities will begin a sewer and water rehabilitation project on North Central Avenue at the intersection of Cleveland Street beginning Monday, April 15th, 2019. The duration of this work is expected to last two weeks. Motorists should be aware Central Avenue traffic will be restricted to one lane in each direction for the duration of this project. 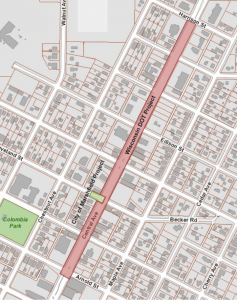 Immediately following the City’s rehabilitation project the Wisconsin Department of Transportation (WisDOT) and its contractor will begin their street rehabilitation project between Arnold Street and Harrison Street. The DOT project is scheduled to begin May 1st and continue thru August 29st. Traffic control for this project will also be restricted to one lane in each direction during the duration of the DOT project. WisDOT will be holding a Public Informational Meeting for the street rehabilitation project on Wednesday, April 24th, 2019 from 5:30 to 6:30 pm in the Common Council Chambers of City Hall located at 207 West 6th Street. If you have any questions please feel free to contact the Engineering Division at 715-486-2034.